China Glaze Electrify, Sally Hansen gem crush Cha- Ching, Revlon Dreamer, Revlon impulsive, Sally Hansen Xtreme Wear in blue it, green with envy, and mellow yellow. Sally Hansen speed dry in rapid red, and China Glaze in roguish red. The top coat I used was of course Seche Vite dry fast top coat. Hope you give it, or something similar a try, I could not stop smiling whenever I looked at these nails :) Thanks for stopping by guys, see ya next time ! Sally Hansen Xtreme Wear Purple Potion. I certainly enjoyed doing these nails. I used a fine nail art brush with an angled tip for all of the painting. I hope you enjoy them as much as I enjoyed doing them :) Thanks for stopping by! So I caught wind of a new twenty week nail art challenge which sounded like a blast. I had previously attempted to participate in a thirty week nail art challenge but I didn't have all the tools I have now so I ran out of steam and inspiration because I had the ideas, but not the tools to achieve them as well as I would have liked to. However I am very pleased with my first look (nautical nails) I had never previously tried this style so it is also my first attempt at nautical nails. Now traditionally they are a darker blue, however I wanted to incorporate some of my glitter polishes as accents and wanted all my polishes to match so mine are a little lighter on the tone scale, but I love it anyway. Let me know what you think and if you want a tutorial for something similar! and also here is the other hand! Hey guys, I recently bought a new 3DSXL, I previously had a regular 3DS but traded up after my boyfriend traded up as well. I had the perfect polish (Wet n' Wild tickled pink) so I figured I would match my nails to my new electronic precious. I am pleased with the results. :) If you are interested the other polishes used are Revlon Spirit, and Essie Chinchilly. So yesterday I started a chain reaction within myself of wanting to do all the houses (whether I like them or not :/) I started yesterday with House Targaryen nails which I was very happy with, however I tend to get really antsy and want to do new manis all the time. I'm sure you can understand. Well I figured I would start with a house I very much like House Stark. Here is a little walk through for how I went about it. First I painted all nails except my ring finger on both hands with Essie Chinchilly. I had to use three coats per nail to get the perfect coverage I was lookinng for. I then painted both ring fingers with Revlon Spirit. Just like that I have my base for this manicure. Next I used a triangular make up sponge and Revlon Spirit to sponge a white tip onto all the gray nails. I only sponged on to the bottom 1/3 of the nail and made sure I still had lots of gray visible. I allowed it to dry fully, as next I was stamping. For stamping I used my Konad stamper and scraper set as pictured in previous tutorials and Bundle Monster plate 323. The color I used was Sally Hansen Xtreme Wear in Celeb City. I stamped the snowflake image onto all of the grey nails on each hand. If you aren't sure about stamping, I am going to be putting up a tutorial for stamping success tomorrow so no worries. Next I used a triangular make up brush, and Sally Hansen Gem Crush in Showgirl Chic (which btw was a present from my best friend :P) to gently sponge the tips of the grey stamped nails to give them some icy sparkle. I then used Essie Chinchilly, Revlon Spirit, and Sally Hansen Xtreme wear in black out to paint an impromptu Dire wolf on my ring fingers. Any fellow GOT fans should know this is the sigil of House Stark. House Starks banners are also a gray Dire wolf rampant on a field of white. I used a fine tipped nail art brush that came in my Bundle Monster set. This is my first time painting a very small scale animal, so personally I think I did PRETTY well haha. Then all I did was to add a little flavor to the thumbs by printing "King in the North" on them with the same fine tipped nail art brush as I painted the Dire wolf with. Of course I then went over it all with Seche Vite dry fast top coat. I would have to say I am pleased :) Hope you enjoy, and thanks for stopping by!! So I freakin love Game of Thrones, and I love Daenerys Stormborn, she is my top favorite character. So while I was re watching the first episode of season 3 last night I decided to do these nails. This isn't a tutorial but I will list the polishes and image plates that I used. So here they are. The thumb is the Sigil of House Targaryen, a three headed red dragon on a field of pure black. The index, middle, and ring finger are Daenerys' dragon eggs, and the pinkie is an ever growing flame, because fire can not kill the dragon. Below I will show the polishes I used for each finger, as well as the image plates. For the thumb I used Sally Hansen Xtreme Wear in black out as the background, and Revlon scented nail polish in Mon Cherry. I used a fine tipped nail art brush to paint the dragon. For the Ring finger I used again black out for the background, and Sally Hansen Xtreme wear in Red Carpet along with the bottom middle image of Bundle Monster image plate 209 pictured above. For the index finger i used China Glaze unpredictable, Wet n wild fast dry in SaGreena the teenaged witch, and Revlon metallic in copper penny. The image plate I used was Bundle Monster 211, I used the dotted print on the left as pictured above. Ok for this finger I used Revlon Top Speed in Spirit, Sally Hansen Diamond Strength #62, and Revlon Gold Coin. I used the top print on the Bundle Monster image plate pictured above, it is number 316 as you can see in the photo. Of course for the pinkie I just used a mixture of these colors ( black out, mon cherry, and copper penny) along with a nail art brush to create a random flame design. Of course I then sealed it all up with super glossy fast dry top coat Seche Vite. Also just inncase you were curious here is the stamper/ scraper I use. It is Konad and retails for around 8.00. I purchased mine from Nail Polish Canada. 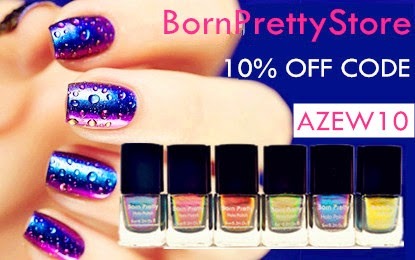 (nailpolishcanada.com) but you can get them at various beauty stores. That's all there is for this one folks! I will follow up with more as I plan to do the other houses as well :P Yes even dirty old Lannister. Feh. Haha :) Thanks for stopping by! It is known (as the Dothraki would say) that Butterfly manicures are one of my favorites. I'm also a really big fan of ombre or gradient nails, I have been seeing a lot of these two elements mixed together so I thought I would try my hand at it. So here are the results, and of course as always, a walk through tutorial so you can recreate it yourself with Whatever colors you wish! Here are the polishes I am going to be using for this one. From left to right they are Revlon Posh, China Glaze Def Defying, and Revlon Zealous. This will be more of a two tone ombre however because the last two colors are very similar, Zealous is quite a thin polish it will really just add a bit of metallic sparkle on top of the China Glaze color. You could use an actual third polish I just wanted these ones. My first step was to paint Revlon Posh onto the entire nail beds of all of my nails. This is a relatively high pigment polish so I only Needed one coat regular coat, and one thin coat. As you can see it's also very shiny :P It is one of my favorite greens btw. I allowed this to dry most of the way. Next I used a regular triangular make up sponge as pictured above and painted a layer of China Glaze Def Defying onto a corner of the sponge. I then dabbed the sponge onto my nail bed covering the bottom 2/3 of the nails. You will have to apply more polish to the sponge as necessary, it will depend on the size of the nails and how much polish you initially put on the sponge. Less is better than more because you can build it up if you don't have enough on the sponge, if you have too much it's going to be a glooby mess just f.y.i. Allow to dry. I then did the same process for Revlon Zealous. I sponged over the whole area where I had sponged Def Defying. As I mentioned previously this color only adds a metallic sheen to the previously applied color. If you wanted to add an actual third color you would apply that color to the bottom 1/3 portion of the nail leaving some of the second color exposed. Allow to dry. Next we are using a M.A.S.H Nail Design Pen in black to create the shape of the wings. My lines are admittedly a bit shaky here as it was my first time doing these nails with this particular pen so I wasn't used to how slowly or quickly the polish comes out. You can also do this with black polish and a nail art brush such as those from the Bundle Monster 20 piece kit I reviewed a few days ago, I just wanted to try out this nail art pen. For the design all you do is drawn a black outline around your nail. Next you draw a scalloped edge beginning at the bottom of one side of your nail and swooping upwards in three or four C shaped sections. It doesn't matter which direction you go in as long as one side is lower than the other. I chose to have the rise go towards my pinky finger direction, this is just how it happened this time, but it looks equally as awesome either way. Then all you have to do is connect the points of the swooped c shapes to the black outline at the top end of your nail on an angle. Easy Peasy. Allow to dry. Next we are going to be using my new favorite white polish Revlon Spirit and a small sized dotting tool to finish off the detail of these nails. What you want to do is dot evenly and carefully around the black on the bottom to create an effect similar to Monarchs wings. The amount of dots you need will of course vary depending on the size of your nails and the shape of your design, but make sure there is still a fair amount of black still showing, always under do it then add more if necessary. Allow to dry. Bundle Monster Nail Art brush kit Review! I have been in the market for a reasonably priced, well rounded nail art brush set. I had shopped around and around but had not found one that had both a wide range of brushes, and a nice range of dotting tools. However at long last I found a wonderful set from Bundle Monster :D!! Both well priced at $14.99 and containing 20 pieces spanning both fine tipped brushes, fan brushes, clean up brushes, angle brushes, flat brushes, and dotting tools It was an amazing deal. Here are some pictures!! Oh and I forgot to mention it came in a super awesome fold up case with two snap closures! Each dotting tool pictured here is double sided with a different size dotting tool on each end. So technically you have 10 dotting tools, one of which is angled. I was so pleased with this purchase, not only for price and content, but for their quality as well. I have used these brushes so much since these photos were taken a few weeks ago at un-boxing and they are so soft and easy to use. You can clean them out with a little nail polish remover after each use, and they still look like new. I love them so much, if you are looking for a nail art brush kit I strongly suggest you check out this great one from Bundle Monster. Also I should mention that while it took a few days longer the 5.00 shipping is very cost effective, and it only took a few weeks to get here. Totally worth the wait for the quality and price. Thanks so much for reading!